Freedom is reborn. The North American continent has been wrested from the brutal grasp of Soviet Warlords, but they have not given up yet. Deep in the frozen Siberian wastes, last ditch elements of the Evil Empire plan to annihilate the Free World in one final rain of nuclear death.Trading his sleek F-16 fighter jet for a larger, heavier B-1B swing-wing bomber, Hunter undertakes his most perilous mission--an impossible 6,000 mile bombing run deep into the heart of the enemy's homeland! 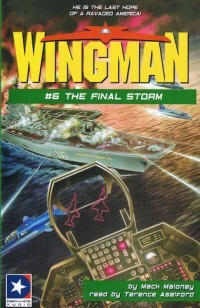 Waging an awesome battle from the cockpit of the last of the Ghostriders, only the Wingman can save his doomed country from extinction. Mack Maloney is a prolific author of men's adventure fiction, including the 16-title Wingman series featuring American hero, Hawk Hunter.